MUCH ADO ABOUT STUFFING: Lima Bean Soup with a Kick, because Summer is going to be over one of these days. Haul out that slow cooker. Lima Bean Soup with a Kick, because Summer is going to be over one of these days. Haul out that slow cooker. Here is one of those fall recipes that will really put you in the mood for the cold cozy nights ahead. There is a ton of good fresh produce in this one. Leeks, kale, carrots etc. The chipotle in adobo gives it an earthy spicy kick. You can make it vegetarian by leaving out the meat entirely, and adding a tsp of "liquid smoke", and kosher by substituting any smoky kosher sausage or "bacon" you have access to. You can even use hot-dogs, for a childhood reminiscence of the pea soup with hot-dogs that your mom or grandma used to make. 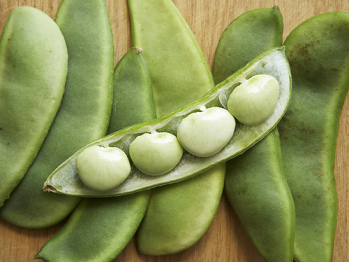 Lima beans are a very good source of cholesterol-lowering fiber, as are most other legumes. In addition to lowering cholesterol, lima-beans' high fiber content prevents blood sugar levels from rising too rapidly after a meal, making these beans an especially good choice for individuals with diabetes, insulin resistance or hypoglycemia. 2 cooked smoked turkey legs, smoked sausage, or "bacon"
Rinse beans. In 4-quart saucepan, combine beans and 6 cups water. Soak overnight. Or bring to boil, reduce heat, simmer uncovered for 2 minutes, remove from heat, cover and stand for 1 hour. Drain and rinse beans, put in slow cooker. Add meat, 2¼ cups water, broth, celery, carrots, leeks, chipotle, rosemary, ¼ teaspoon pepper, bay leaf. Cover and cook on low heat setting for 11 to 13 hours, or high heat 5½ to 6½ hours. Remove meat, cool. Mash some of the beans slightly or put in blender and return. Cut meat off bones, or cut up sausage and return. Discard bones and bay leaf. Stir kale into soup. Season to taste.